As the seasons bring cold weather, we travel to Miyazaki Prefecture, located in the southern region of Kyushu in Japan, for its relaxed pace and pastoral lifestyle. Miyazaki Prefecture borders the Pacific Ocean on the east and is surrounded by mountains–many volcanic–to the north, west and south. The central part of the prefecture is cattle country, where wild horses roam and prized wagyu beef is bred. And in its northwestern region, legends about the birth of Japan abound. We start our tour this month in Miyazaki City, the political, economic, cultural and administrative center of the prefecture. Less than half a million people reside in Miyazaki City, yet the city offers numerous traditional and modern experiences. The city is fabled as the home of Japan’s first divine emperor, Jimmu, who was said to have lived during the 7th century BCE. The Hakko Ichiu Pillar was erected in the Miyazaki Culture Park in the 1940s to commemorate his rule and the “birth of Japan” and is a beautiful monument to visit along with art museums, science centers and museums focused on nature and history. Miyazaki City also boasts an impressive torii gate made entirely of cedar wood at the Miyazaki Shrine. 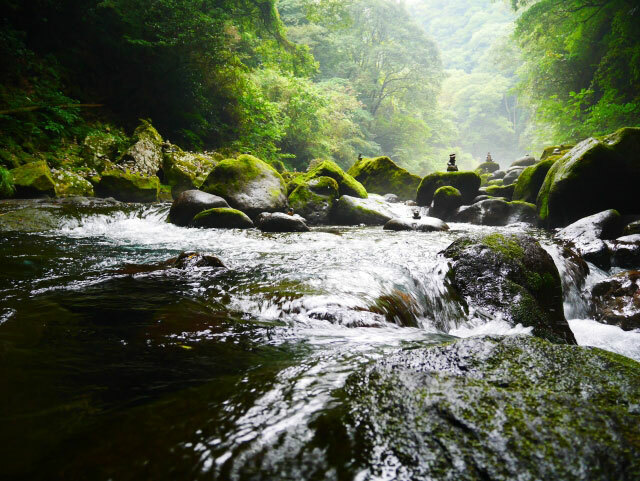 From Miyazaki City, traveling north and to the west takes you into the Kyushu Mountains, where the Gokase River has carved the Takachiho Gorge through mountains and solitary forests. Going through the gorge, you see sheer red lava rock walls and Manai Falls, which drop water from 56 feet high to mist the passage along the river. Here, in the gorge, the Shinto Sun Goddess Amaterasu escaped her brother to burst forth through the mountains, bringing the sun and life to the earth and founding the line of the emperors of Japan. Traveling from the Takachiho area to the southwestern part of the prefecture takes us into the Ebino Plateau Area, where high lakes dot the volcanic highlands. From here, we go through the central part of Miyazaki Prefecture, where prized Japanese Black cattle, or Kuroge Washu, are bred for their succulent, marbled beef and where you can find hundreds of ancient kofun burial mounds from the 4th century BCE. 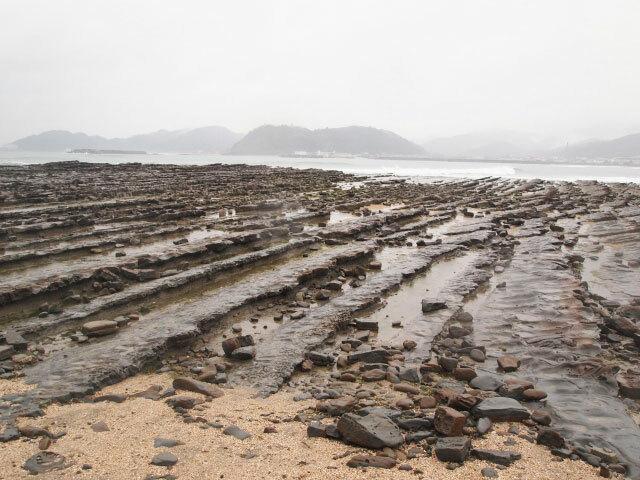 The Nichinan Coast along the Pacific Ocean boasts beautiful beaches and is the launch point for Aoshima Island, famous for the basalt rock formations called the Devil’s Washboard. These rock formations hide under the sea until low tide, when their striped patterns can be seen far into the ocean. While Miyazaki Prefecture is slower-paced than areas with megalopolis like Tokyo and Kyoto, it is famous for its gourmet foods. Taiyo no Mango, one of Japan’s most exclusive fruits, is famous for being the most expensive mango in the world. These mangoes are cultivated on trees grown in greenhouses, where the fruit is ripened until it falls off the tree and sold for thousands of dollars! Shochu is also famously produced in this region, and the highly regarded distilled alcohol is paired with many local delicacies. Perhaps one of the most quintessential Miyazaki foods is nikumaki onigiri, a simple rice ball wrapped in thinly sliced pork. Cooked, salted rice is shaped into small balls and wrapped with raw, thinly sliced strips of pork. 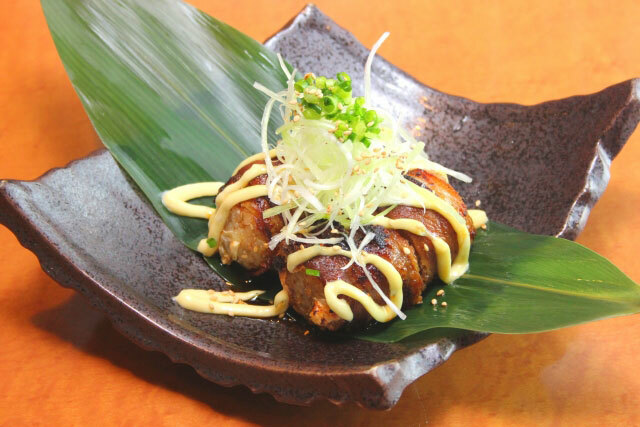 The rice ball is cooked until the meat is tender and juicy, and then basted with a mixture of soy sauce, mirin and sugar, enhancing the savoriness of the meat. We know you’ll love this dish as much as we do, and can’t wait to see your comments and photos below! 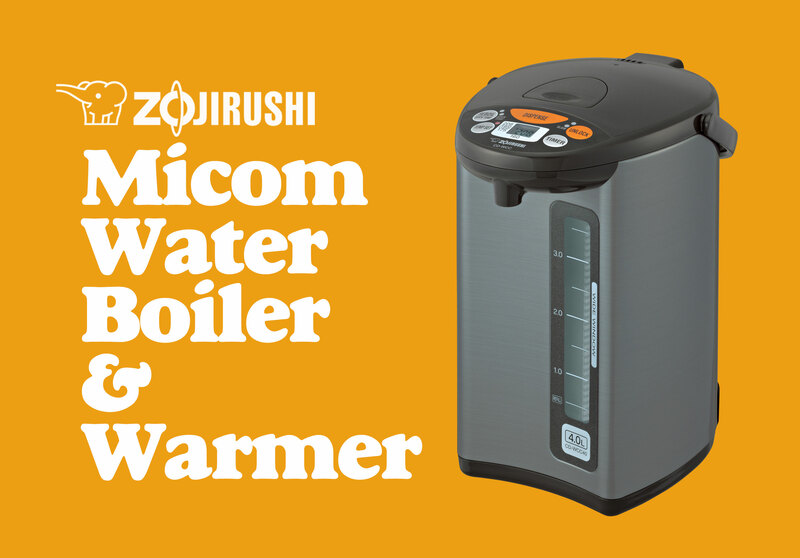 The Zojirushi Micom Water Boiler & Warmer (CD-WCC30/40) is one of our user-friendly water boilers, stylish and full of features. This water boiler comes in 3 and 4 liter capacities and is versatile enough to heat water for brewing green and black teas, making coffee, preparing instant noodles or oatmeal, blanching vegetables and heating water to warm up baby bottles. The water boiler has four settings to heat water to 160°F, 175°F, 195°F and 208°F. It also comes with the optional QUICK TEMP MODE, a great feature for those who prefer to use filtered water or who need to quickly heat water to 160°, 175° or 195° without first bringing the water to a boil, saving time and energy. These temperatures are ideal for many types of teas. Delicate teas are best brewed at 160°F, while 175°F is the ideal brewing temperature for green teas. Oolong tea is best brewed at 195°F, and at 208°, the hot water is great for brewing black teas and herbal teas. At 208°, water is also hot enough to make coffee, instant noodles or oatmeal and blanch vegetables. The LCD panel shows the actual water temperature at all times, and the convenient delay timer function also saves energy by shutting off electricity to the heater until it’s time to heat water again. To heat water, fill the inner container with water, plug in the machine and select the desired temperature setting. Once the temperature is set, the water boiler will prepare hot water. Easy as that. Deep cleaning is simple with our Citric Acid Cleaner. And whenever the gaskets along the lid wear out, new ones can be ordered and fitted, so that the entire machine doesn’t need to be replaced. This water boiler also comes with multiple safety features including auto shut-off, which turns off the machine when there is no water in the inner container, an automatic dispense lock and a removable magnetic power cord which fully and easily detaches from the machine. The nonstick coated stainless steel inner liner and all other food contact zones are BPA-free, and combined with an easy-to-read water level gauge, a swivel base and a sturdy handle, this Micom Water Boiler & Warmer performs great at home or at the office. We’re so inspired by the many uses this water boiler has. Imagine having hot water ready for tea at your next book club meeting. Or ready for coffee, tea, instant noodles at your office mini-kitchen. Or simply available for your family on a lazy Sunday afternoon. 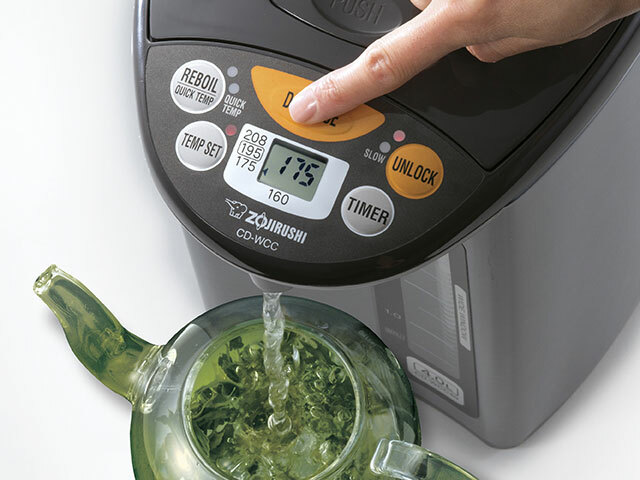 This water boiler and warmer is versatile enough for any situation and for recipes like Hot Green Sencha Tea or classic British Tea. No matter what you’re using it for, be sure to share your favorite recipes with us! If you’ve been guilty of this, you’ve probably been told not to pour soy sauce on your rice if you visit Japan (yes, it’s bush league). But that doesn’t mean the Japanese eat their rice plain and without flavor. No, the trick is to take a mouthful of salty grilled fish, tangy deep fried pork or whatever tasty dish you have in front of you, then eat your bland white rice. If you think about it, you wouldn’t want your rice to be salty or spicy too, if you’re eating it with another dish. But what happens if you don’t have enough dishes to eat with your rice? Or if you’re still hungry and all you have left is a bowl of rice? 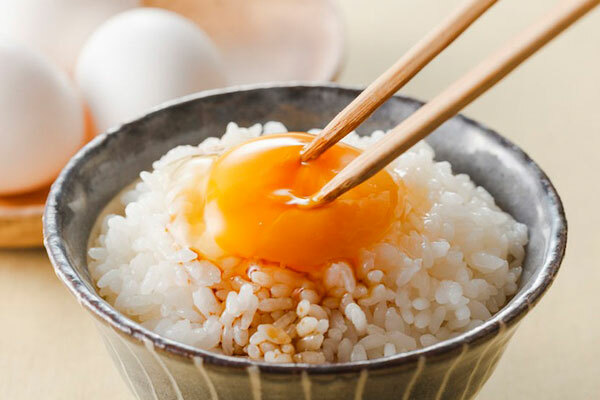 You do what the Japanese do—you look in your refrigerator or cupboard and find the dozens of ways to accompany your rice so that it isn’t so plain anymore. You do not pour soy sauce on it! 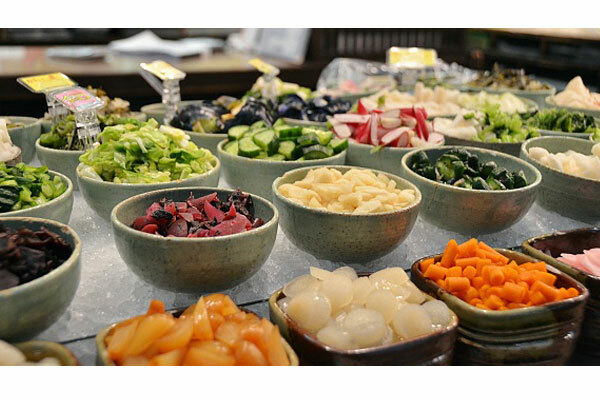 You’ll find a variety of vegetables used to make tsukemono in all its forms, like cucumbers, eggplants, Chinese cabbage, daikon radish, carrots, turnip greens, ginger, scallions, etc. At Japanese restaurants, they’re usually served in their own little dish off to the side. Don’t ignore it next time—try it with some rice; it’s very addicting. A lot of families pickle their own at home, which is very easy to do these days. All you need is a large earthenware pot, a heavy stone or concrete block, and a cool storage area or backyard to bury it underground. Just kidding! My grandmother used to do it that way, but you can just buy a spring-loaded pickling press and do it on your kitchen counter. These specialized Japanese kitchen gadgets an be found at most Asian markets. Furikake Affectionately known as “rice sprinkles”, the best part of this dry seasoning is that unlike tsukemono, you don’t have to refrigerate it and it has a good shelf life. They come in packets or jars, in multi-colored, multi-flavored varities, and it can be used as a topping on rice, vegetables or fish. Depending on the ingredients used inside the mix, furikake can taste like fish, eggs, sour plum, seaweed, spicy wasabi, or even teriyaki. This is a great way to eat leftover rice or as seasoning on bento rice (makes it look good too). My favorite way of using furikake is to mix it in hot rice and to roll it into rice balls (onigiri). 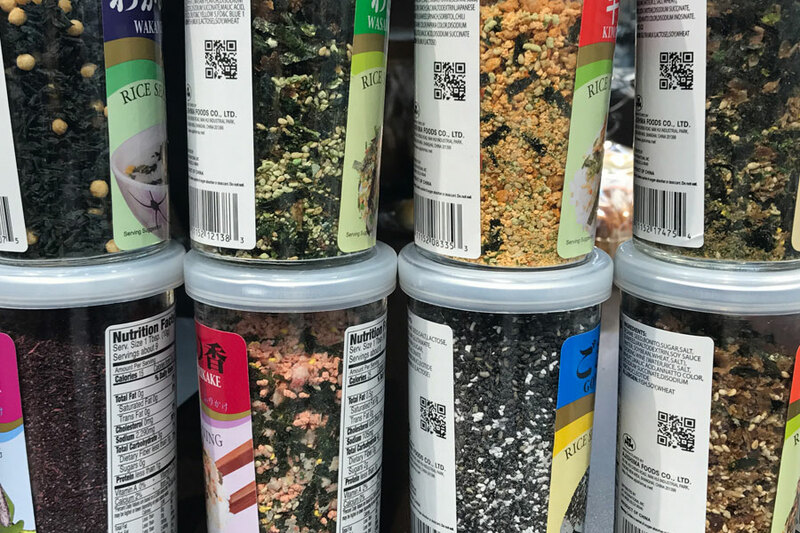 If you go looking for furikake, be sure to see what kind of ingredients are in it, so you’ll know whether it’s going to make your rice salty, sweet or sour. The seaweed,shrimp and egg varieties tend to be milder and have a slight sweet/aromatic flavor. 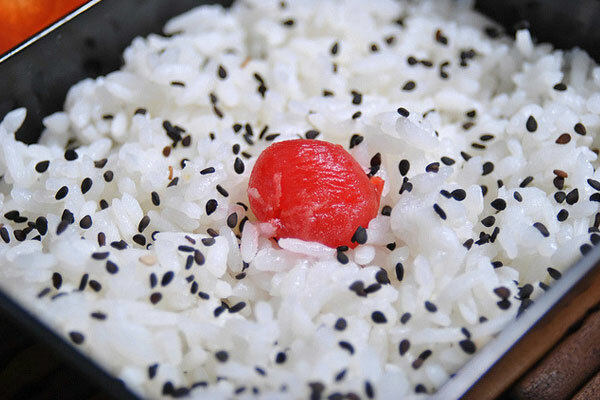 Most of them fall into the salty range and many are quite deep with umami when sprinkled on hot white rice. If they have bits of dried plum bits (umeboshi) you can taste the tangy sourness mixed in. And if you’re not good with spicy, make sure it doesn’t contain wasabi or kimchi flakes—but if you like spicy, I think they really dress up your rice! Here’s a handy chart put out by Asian Food Grocer, an online supplier. 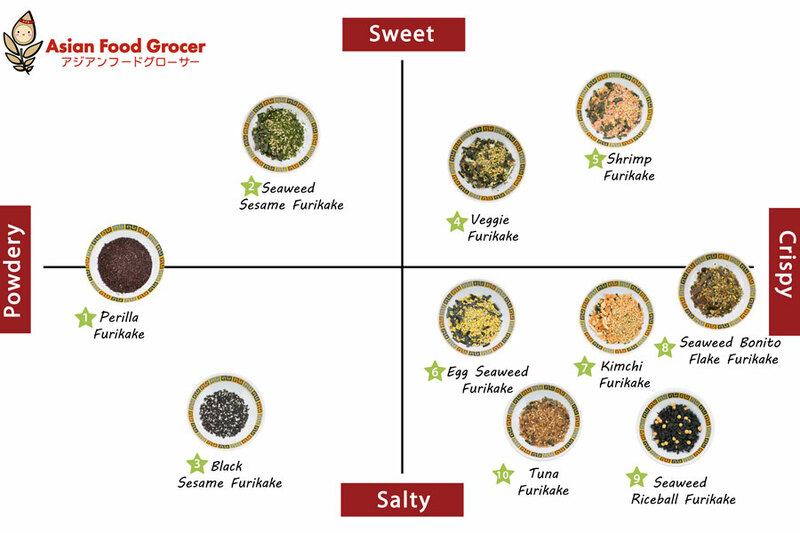 You can also find furikake at most Asian supermarkets. 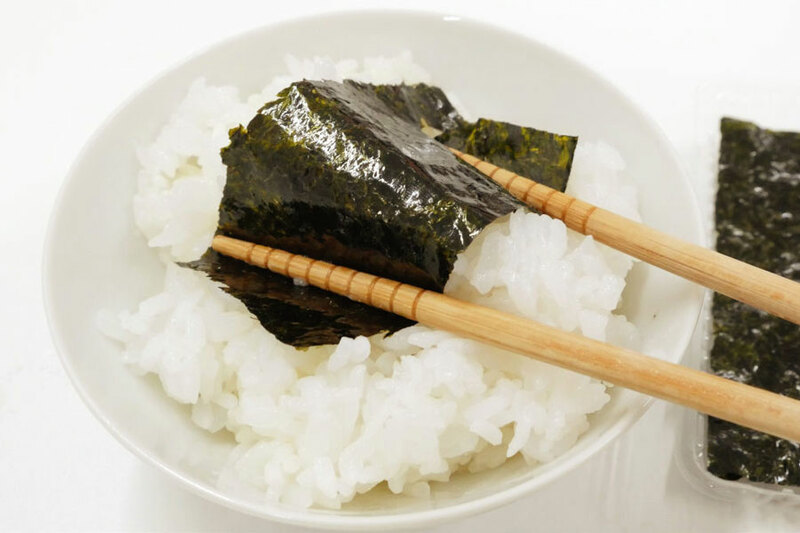 The type of seaweed (nori) than you see on sushi doesn’t have any flavor added to its already rich umami, but there are flavored kinds (ajitsuke nori) that you can eat with white rice that are excellent during meals. You may have seen them as a common add-on at a typical Japanese style breakfast. They’re usually seasoned with a teriyaki tasting sweetness, and come in narrow sheets—packed in cellophane packaging to preserve crispness. If you want to eat this with your rice properly, practice your chopstick skills, because you’re supposed to wrap the sheet around a mouthful of rice like a small sushi roll and pop it into your mouth. 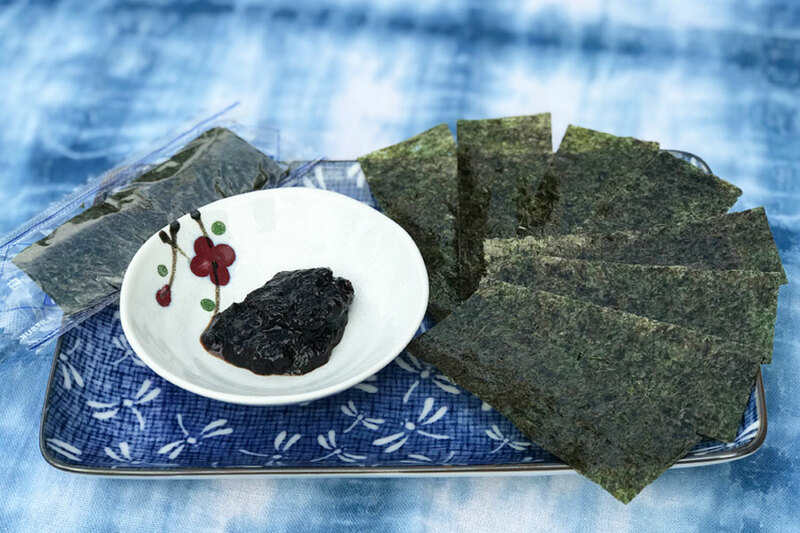 I prefer tsukudani nori, which is more of a paste made with seaweed and strongly flavored with soy sauce. It’s not the most appetizing of looks for seaweed, but trust me, on hot white rice it’s so good! But use carefully because it is salty. And kids love it—I would slather this on my rice. Umeboshi And of course, the classic way to eat white rice is a patriotic one for the Japanese. The mighty sour plum, known as umeboshi, is what decorates the center of a bed of plain rice when you make the traditional “Hi-no-maru Bento”. The traditional hinomaru is named after the Japanese national flag because it resembles it—a red dot on a field of white. Many years ago I remember seeing a comedy on Japanese TV, in which a penniless bachelor would make his umeboshi last by only having one piece for his dinner. He would hang it by a string in front of him and stare at it until the sourness of it made his mouth pucker so he could eat his rice and imagine the flavor. After his meal, he untied the umeboshi and put it away for next time! LOL! 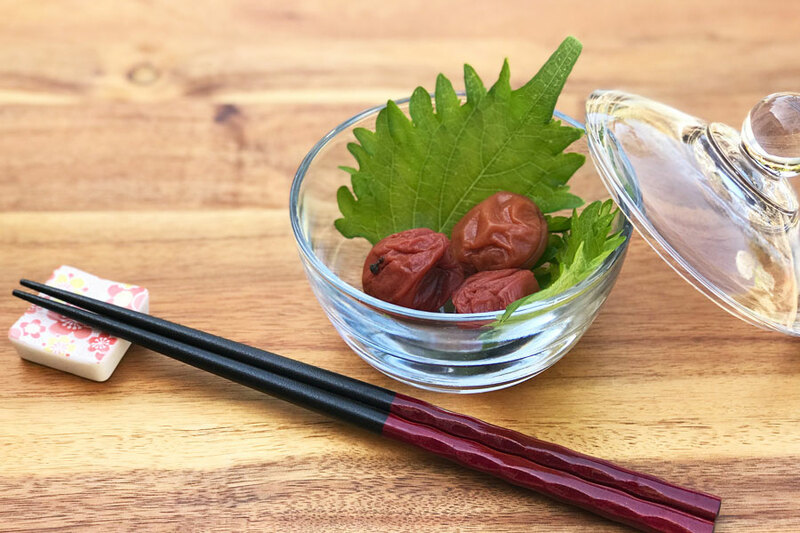 Seriously though, umeboshi is very popular in Japan because they’re also thought to have health properties as a digestive aid, as a prevention against nausea and hangovers, and to help combat fatigue. So good on a bowl of rice, or stuff one into a rice ball (but watch out for the pit)! photo credits: Tsukemono by Japan-Guide.com, Hinomaru Bento by PamandJapan, Furikake Chart by Asian Food Grocer, Wrapping Nori by Gigazine, Tamago Kake Gohan by JP Info, and all other images by Bert Tanimoto.